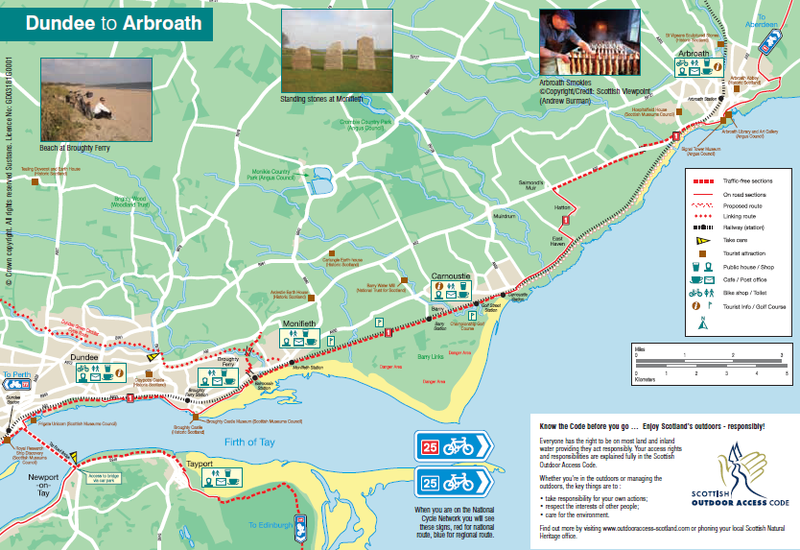 In May 2012 the Guardian newspaper featured the Dundee to Arbroath cycle route as one of 'Britian's Best Bike Rides'. It's right on our doorstep and I can confirm it is a real gem. Last week I took advantage of the warm weather and cycled the roads and miles from Broughty Ferry to Arbroath and back. The fact that most of the route is off road on shared paths for walkers and cyclists, makes this a relaxed ride and easy to appreciate the sea views. While there is little motorised traffic to worry about, on the sections between Broughty Ferry and Monifieth you do need to be really alert for pedestrians and dogs and of course other cyclists. I particularly enjoyed the section from East Haven to Arbroath that has most recently been opened. The new route runs between the railway line and the beach. Note on the Sustrans map below, this part of the route is described as 'proposed'. Congratulations to Dundee City Council and Angus Council for their joined up work with financial support from Sustrans, the sustainable transport charity. "This popular Scottish route is a lovely, flat, mainly traffic-free ride along the Tay estuary. Start from under the Tay road bridge (you'll need photo ID to get through the dock area, so if you don't have it, start from the east of the port). The route heads to Broughty Ferry, before hugging the sea to Monifieth. The route continues on a traffic-free path over Barry Links, with its low sand dunes (great for wildlife) and on to Carnoustie with superb views of the bay. The route finishes by Arbroath's historic harbour, famed for its Arbroath smokies (haddock smoked over burning woodchips)."